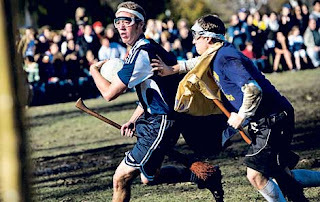 NPR ran a story a few days ago about several colleges around the country who will be participating in this years Fourth Annual Quidditch Cup. Abso-freakin'-awesome. Not only are these schools dusting off their broomsticks and quaffles in hopes of coming home the champion but they are also ultimately hoping the sport will eventually achieve NCAA recognized status. The snitch, otherwise known as the "Snitch Runner," is a guy with a sock hanging out of the back of his shorts. According to the official IQA rule book, "The Snitch Runner evades both Seekers at all costs, doing everything he can do to prevent the Snitch from being caught." I seriously hope this guy is in amazing shape. 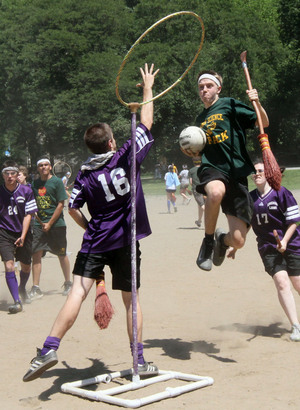 Frankly if you are a prospective college freshman, I'd take a good long look at my schools extra-curricular activities and make sure that Quidditch makes the cut. Cause that's a deal breaker. Oh wow, I envy them! I would love to play Quidditch, even without flying broomsticks. I wanted to thank you for turning me on to hyperbole and a half. It is cracking me up! That's awesome! I wished my university had some Quidditch team : that's one I would go cheer for!